Hanoi (VNA) – The national flag carrier Vietnam Airlines on August 17 carried 2.5 tonnes of goods raised by the Vu A Dinh scholarship fund to flood-hit victims in the northern provinces of Son La and Yen Bai on August 17. The relief delegation was led by Truong My Hoa, former Vice State President and Chairwoman of the scholarship fund. According to the Central Steering Committee for Natural Disaster Prevention and Control, since the beginning of August, heavy rains and flash floods in northern mountainous provinces have claimed at least 34 lives and left 11 others missing. Many people have lost their houses. 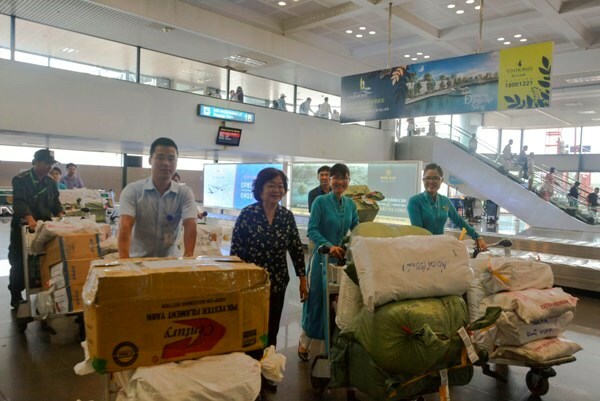 To promptly support flood victims, Vietnam Airlines has given free flights to carry donated goods to those in need.